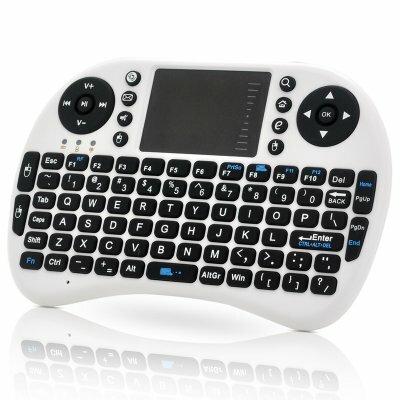 Successfully Added Wireless QWERTY Keyboard + Mouse Pad - Game Controller, Wireless Dongle to your Shopping Cart. Wireless Keyboard, Game Controller and Touch Mouse Pad combo uses a QWERTY layout and comes with a dongle for connectivity to your PC or Android TV box. 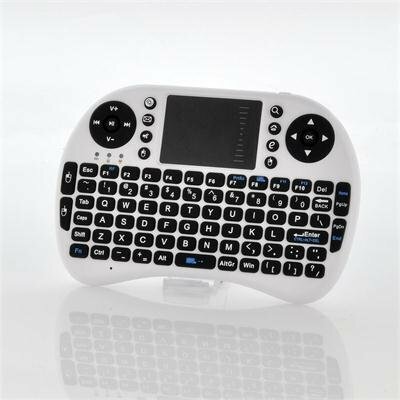 Ideal for anyone who wants to sit back and relax using their computer, Android TV box or any device with devices a USB port with this fantastically designed keypad that combines a QWERTY keyboard, game controller and touch pad. The touch pad acts the same as a mouse by directing the cursor through your finger movements. The layout of the keyboard is a standard QWERTY layout that ensures the user will be familiar with the location of the keys. There is also two different directional ‘D-pads’ that could be used when wanting to play games. To use this keypad just use the dongle that accompanies the keypad (located in the back of the keypad, next to the battery) and insert it into a USB port to provide a 2.4GHz transmitting frequency that gives the keypad a 10 meter maximum usage range, therefore you should more than enough distance to sit back and use this keyboard to write e-mails and use the touch pad to navigate through menus. This keypad is compatible with the more popular operating systems such as Windows, Linux, and Mac OS. A brilliant diverse keypad that allows you to type, navigate and control all through one device. This product is in stock and can be dispatched within 24 hours of ordering with a 12 month warranty. Brought to you by the leaders in wholesale electronics and tablet PC accessories, Chinavasion. Item as describe,nice keyboard only hope it will work as expected. This is a product which really surprised me since it performed better than i thought it would. It works on all platforms windows, android, Mac Os and any gadget that has a USB port. Very easy to use and seamless setup. Highly recommended. Keep up the good work guys!! great product..Works very good !! Nice size for livingroom use. fits in pockets. Soft keys like on remote controles.